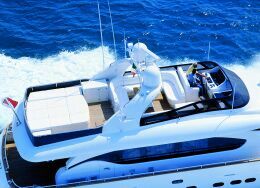 Fipa, or rather the Fipa Group, is one of the most competitive Italian operators in the luxury motor boat sector. 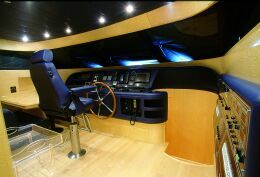 Thanks to a recent acquisition, it also produces the fast commuter Ab Yachts as well as the Maiora maxiyachts; moreover, it has important collaboration agreements currently in progress with boatyards such as Tecnomar and Ars Monaco. Success has also been achieved at an international level, thanks above all to the Maiora range, easily recognisable motoryachts thanks to a completely personal "family feeling", marked by elegant, always up-to-date lines, in step with the evolution of design but never in extremes. A continuous development which doesn't just concentrate on aesthetic appeal, but rather, considers all aspects regarding the hull. From the range, currently composed of 20 to 31-metre boats, but in the very near future to include 38-metre boats and other larger models, we here present the Maiora 24, without doubt one of the most sought after because she's able to best sum up the "spirit" of the yard. First of all, there is the reliable semi-displacement bottom, result of all the technical experience of the yard, so-called know-how; and then she's also comfortable, with high performance. 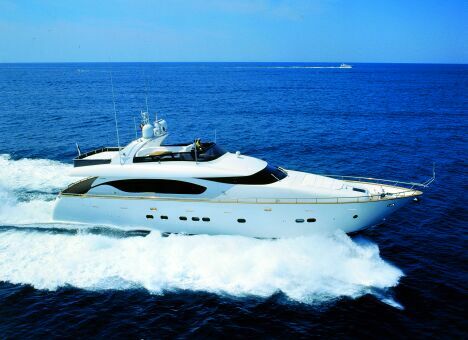 In the motorized version with two MTÙs of 1,500 HP each, in average load conditions the hull achieves a maximum velocity of 28 knots, with a cruising speed of 24. Then there are the interiors, designed to allow for maximum exploitation of the available spaces, very important for making best use of every single environment. On a boat of these dimensions, to say that the living room is big, though true, is maybe a little obvious. This is less obvious when referring to the boat's 4 staterooms. 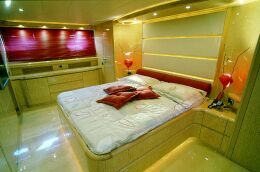 The largest is the boat owner's cabin situated in the centre of the boat, fitted with highly exclusive furnishing, complete with a plasma television and with a similarly large bathroom. 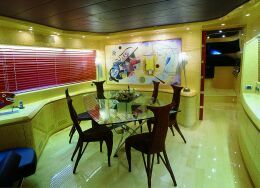 Then there is the VIP stateroom, situated in this case at the bow, slightly less spacious but equally well "furnished" in terms of accessories and finishing. 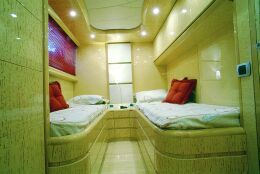 Then, the two guest staterooms, both with their own bathroom and practically identical for size and arrangement of the twin beds. This, the standard layout, may on request, be modified with the creation of a study, installed on the "lower deck" where the sleeping area is situated. 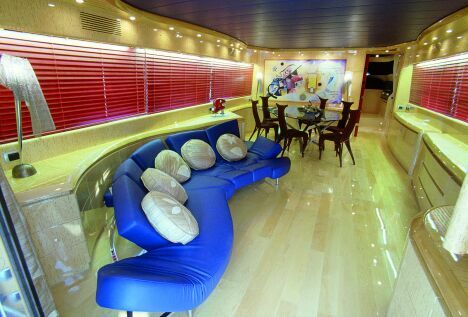 Returning to the main deck, we have already mentioned the vastness of the space available, subdivided into living area, dining area, galley and a large area reserved for the interior bridge. Again in this case, the yard has provided for the possible development of two different lay-outs, in order to offer the potential ship owner the most suitable solution for his needs. All the interiors are constructed by extremely qualified workmen, Viareggio craftsmen highly specialised in the working of precious woods and marbles that enrich the furnishing of all the interiors. Also in this case the customer has the opportunity of choosing both the material to use and the type of working, and also the upholstery and furniture. Much care has been given to the exploitation of the external spaces, as can be seen by observing the fly, for example. Already extensive, its utilisable surface can be extended by the possibility that the yard offers of moving the position of the tender, normally abaft the area, directly onto the deck, at the bow, in a special hanger under the sundeck. Water tank capacity: l 2,000.